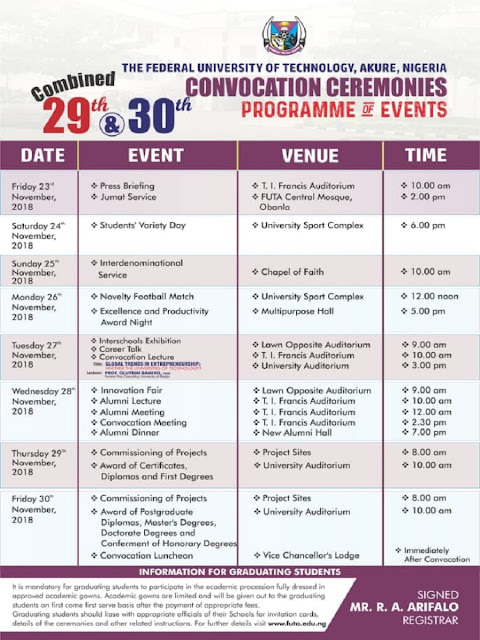 Federal University of Technology, Akure (FUTA) 29th and 30th Convocation Ceremonies Programme of Events Schedule for 2016/2017 and 2017/2018 Graduands - 2018. The high-points will be the Award of Certificates, Diplomas and First Degrees on Thursday November 29 and the Award of Postgraduate Diplomas, Masters Degrees, Doctorate Degrees and the Conferment of Honorary Degrees on Friday November 30, 2018. Graduating students in the 2016/2017 and 2017/2018 Academic Sessions should note the dates. It is mandatory for graduating students to participate in the academic procession fully dressed in approved academic gowns. Academic gowns are limited and will be given out to the graduating students on first come first serve basis after the payment of appropriate fees. Graduating students should lime with appropriate officials of their Schools for invitation cords details of the ceremonies and other related instructions.